Hello, my name is Kristy and I am EXTREMELY type A.
I'm a planner, a scheduler, an organiser and let's be honest... a MAJOR perfectionist... and probably a bit obsessive too. When I entertain, it's planned to the nth degree. You'll find me with lists or what I'm making, what I need to buy, what needs to be made when - I'll even plan out what plates and serving dishes I'll use. But lately? I've been trying to be a little more spontaneous. This means less elaborate plans and more spur-of-the-moment celebrations - and that calls for some quick and easy last minute recipes. With Australia Day this Friday, I thought now was the perfect opportunity to share a quick and easy last-minute treat recipe that you can literally make in minutes. That way, whether you've got an elaborate celebration pre-planned or need something to whip together for an unscheduled catch up, I've got you covered. Be warned though... these truffles are kind of addictive. They're not a healthy treat per-say - but I'm one who thinks moderation is always healthier than restriction - so enjoy away! 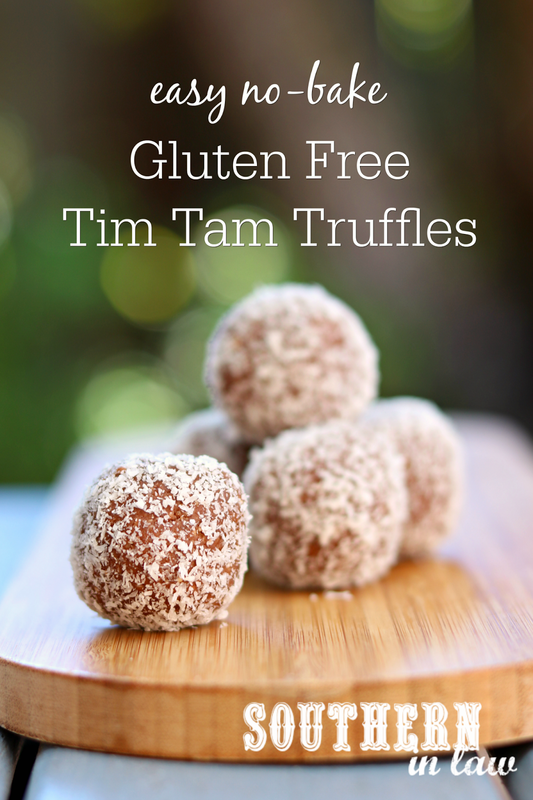 And, if you've got a preplanned celebration - I've also shared some ideas to make these truffles even more impressive. 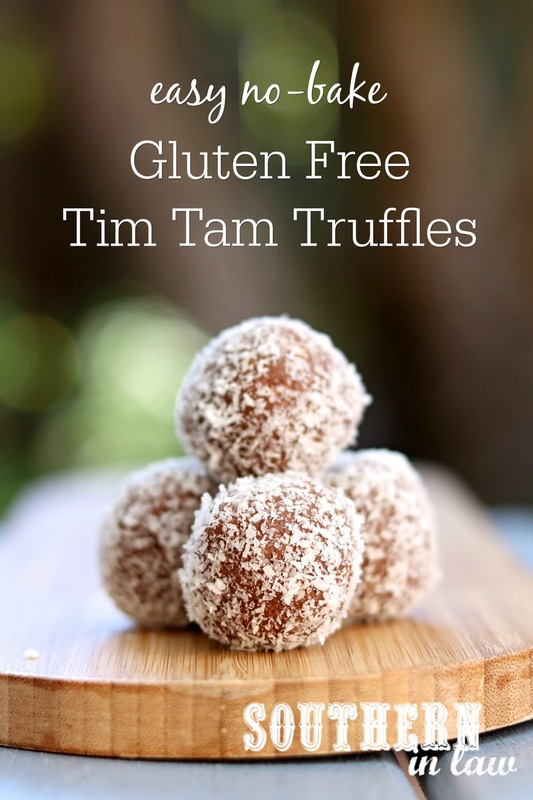 In a food processor, process your tim tams until no large chunks remain. Add your cream cheese a tablespoonful at a time - using just as much as needed to form a firm "dough". Don't worry! If you add too much, simple add a tablespoon or so of coconut flour to firm the mix back up - or more biscuits, if you have an extra packet on hand. Once your mixture is combined, take the "dough" and roll it into bite sized truffles. Roll each of your truffles into coconut (or the topping choices below) and place your truffles onto a tray, plate or into a container. Place your truffles in the fridge to chill or enjoy immediately. These truffles will keep for 2-3 days in the fridge in an airtight container and can also be frozen. They are best kept and eaten chilled. *I used Woolworths' Free From Double Chocolate Biscuits but you could also use Leda's "Choculence" biscuits which are similar. 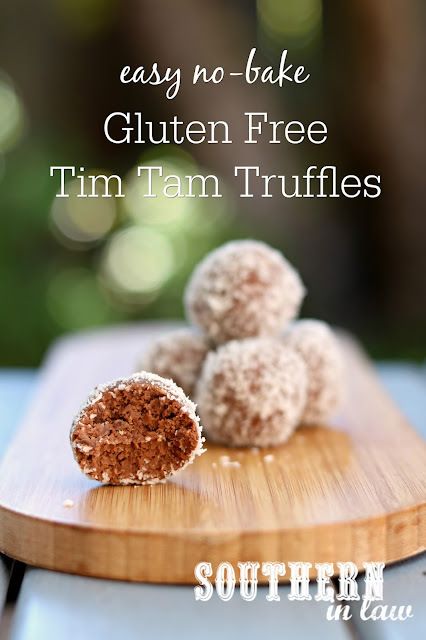 Instead of coconut, you can also roll these truffles in chocolate sprinkles (or regular sprinkles), cocoa powder or dip them into melted chocolate. If dipping them in chocolate, I find it's easier to freeze the truffles before dipping them into the chocolate. Once they're dipped in chocolate, place them onto a tray lined with baking paper and place them in the fridge to set. If you want a richer chocolate flavour add 1-2 tbsp cocoa powder. I find the Free From biscuits aren't as chocolate-y as I'd like so I have been adding some extra cocoa. But tell me, are you someone who likes a plan? Or do you like to go with the flow?